Snow is a major event here in North Carolina, and the University and Library were operating accordingly under a “severe weather policy” last week due to 6-12 inches of frozen precipitation. While essential services continued undeterred, most of the Library’s staff and patrons were asked to stay home until conditions had improved enough to safely commute to and navigate the campus. 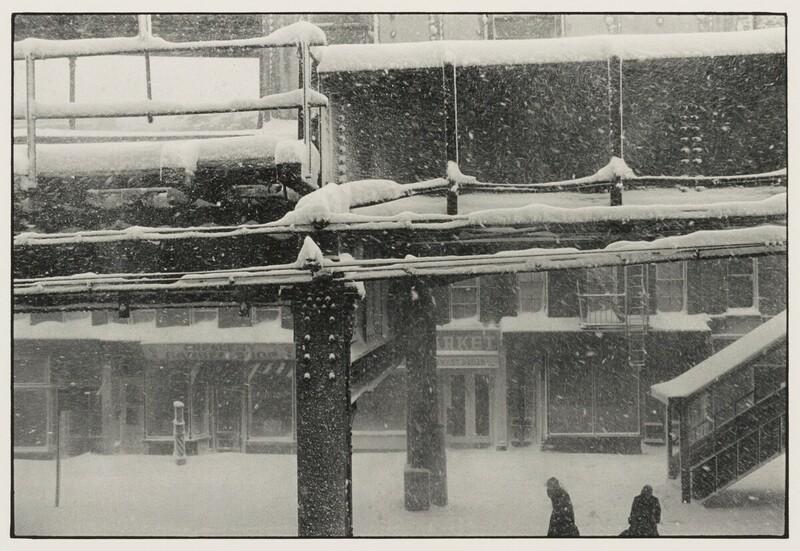 In celebration of last week’s storm, here are some handy tips for surviving and enjoying the winter weather–illustrated entirely with images from Duke Digital Collections! Stock up on your favorite vices and indulgences before the storm hits. 2. 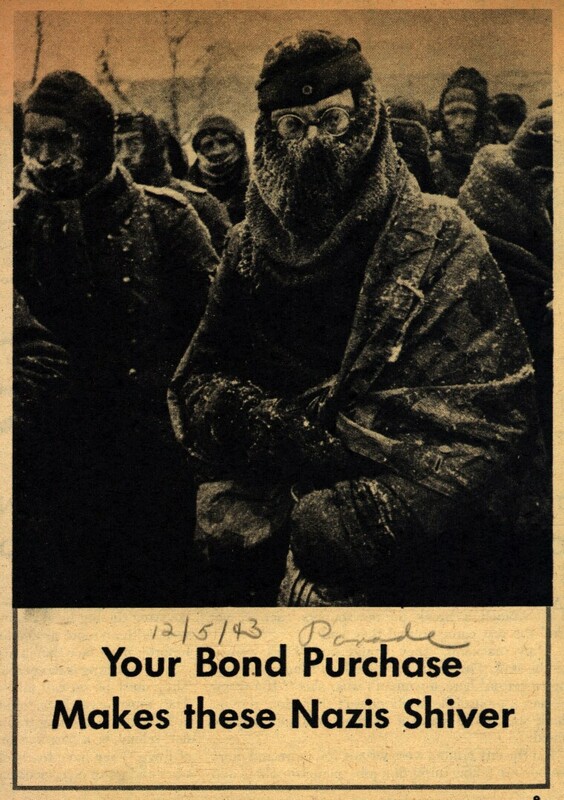 Be sure to bundle and layer up your clothing to stay warm in the frigid outdoor temperatures. 3. Plan some fun outdoor activities to keep malaise and torpor from settling in. 4. Never underestimate the importance of a good winter hat. 5. While snowed in, don’t let your personal hygiene slip too far. 6. Despite the inconveniences brought on by the weather, don’t forget to see the beauty and uniquity around you. 7. 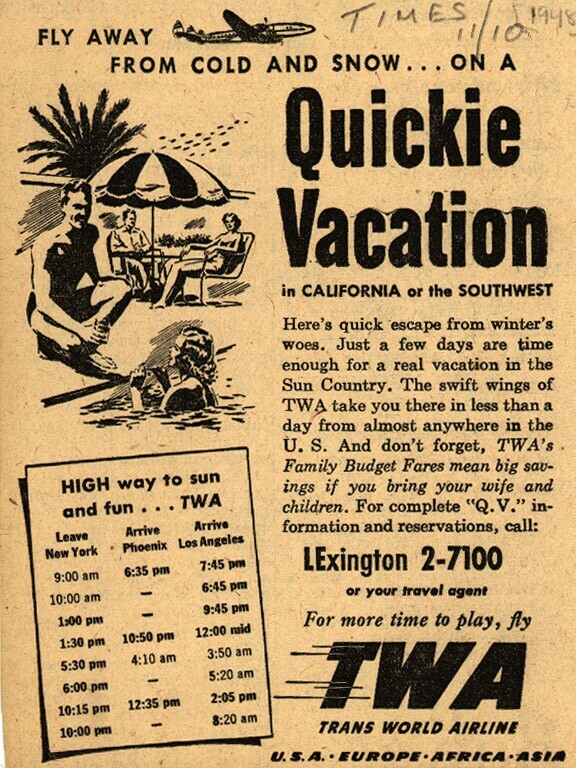 If all else fails, escape to sunnier climes. 8. Be thankful that Spring is on the way! 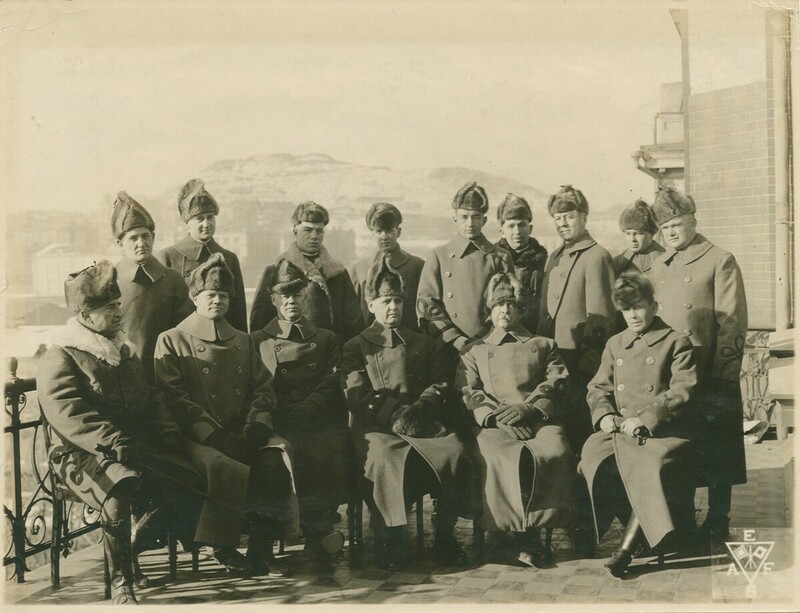 The images in this post are taken from the following digitized collections: J. Walter Thompson Ford Motor Co. Advertisements, Ad*Access, William Gedney Photographs and Writings, Paul Kwilecki Photographs, W. Duke, Sons & Co. Advertising Materials, and Americans in the Land of Lenin: Documentary Photographs of Early Soviet Russia. OpenSeadragon viewer in action on W. Duke & Sons collection. OpenSeadragon zoomed in, W. Duke & Sons collection. 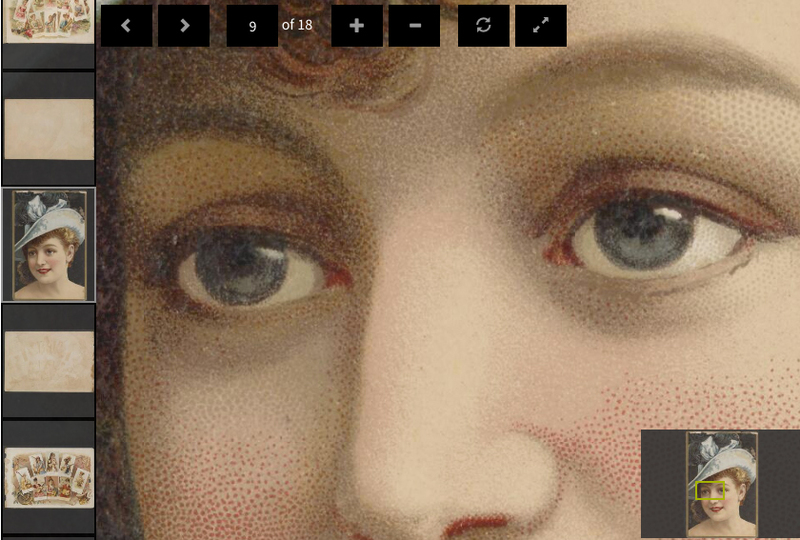 We can’t wait to get to share more of our image collections in the new platform. The Metropolitan Museum of Art. Zooming in close on this van Gogh self-portrait gives you a means to inspect the intense brushstrokes and texture of the canvas in a way that you couldn’t otherwise experience, even by visiting the museum in-person. Self-Portrait with a Straw Hat (obverse: The Potato Peeler). Vincent van Gogh, 1887. Chronicling America: Historic American Newspapers (Library of Congress). For instance, zoom to read in the July 21, 1871 issue of “The Sun” (New York City) about my great-great-grandfather George Aery’s conquest being crowned the Schuetzen King, sharpshooting champion, at a popular annual festival of marksmen. The sun. (New York [N.Y.]), 21 July 1871. Chronicling America: Historic American Newspapers. Lib. of Congress. Other GLAMs. See these other nice examples from The National Gallery of Art, The Smithsonian National Museum of American Museum, NYPL Digital Collections, and Digital Public Library of America (DPLA). The software began with a company called Sand Codex, founded in Princeton, NJ in 2003. By 2005, the company had moved to Seattle and changed its name to Seadragon Software. Microsoft acquired the company in 2006 and positioned Seadragon within Microsoft Live Labs. In March 2007, Seadragon founder Blaise Agüera y Arcase gave a TED Talk where he showcased the power of continuous multi-resolution deep-zooming for applications built on Seadragon. In the months that followed, we held a well-attended staff event at Duke Libraries to watch the talk. There was a lot of ooh-ing and aah-ing. Indeed, it looked like magic. 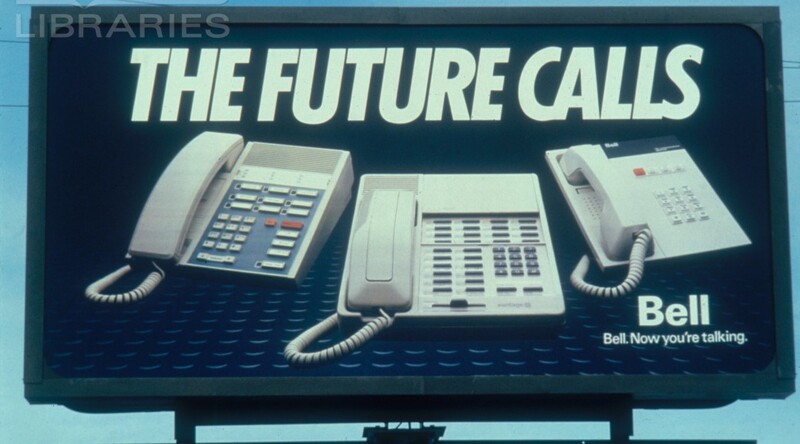 But while it did foretell a real future for our image collections, at the time it felt unattainable and impractical for our needs. It was a Microsoft thing. It required special software to view. It wasn’t going to happen here, not when we were making a commitment to move away from proprietary platforms and plugins. Sequence Mode. Previous/Next navigation through an image sequence. Image Reference Strip. Clickable thumbnails. Viewport Navigator. Small thumbnail showing current position in overall image. IIIF Tile Sources. Provide the viewer with an array of IIP-generated IIIF info.json URLs: it does the rest. Some aspects of the interface weren’t quite as we needed them to be out-of-the-box, so we added and customized a few features. Custom Button Binding. Created our own navigation menu to match our site’s more modern aesthetic. OpenSeadragon does have some limitations where we think that it alone won’t meet all our needs for image interfaces. When we have highly-structured paginated items with associated transcriptions or annotations, we’ll need to implement something a bit more complex. Mirador (example) and Universal Viewer (example) are two example open-source page-viewer tools that are built on top of OpenSeadragon. Both projects depend on “manifests” using the IIIF presentation API to model this additional data. 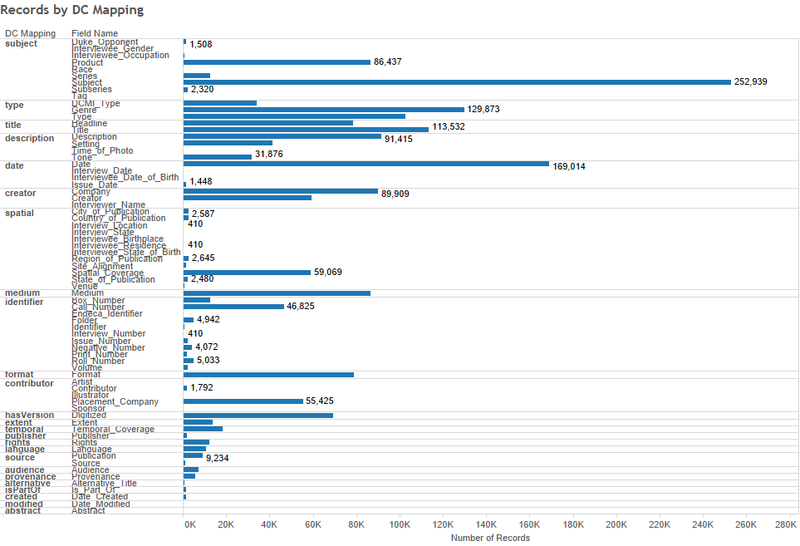 The Hydra Page Turner Interest Group recently produced a summary report that compares these page-viewer tools and features, and highlights strategies for creating the multi-image IIIF manifests they rely upon. Several Hydra partners are already off and running; at Duke we still have some additional research and development to do in this area. We’ll be adding many more image collections in the coming months, including migrating all of our existing ones that predated our new platform. 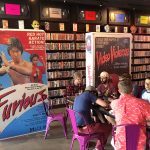 Exciting times lie ahead. Stay tuned. 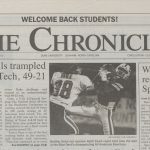 Duke University Libraries has been sharing its rich resources by creating and publishing digital collections for more than 20 years (remember the Scriptorium? ), and to date the digital projects team stewards more than 100 collections consisting of 191,000+ items. Over the years the technologies and practices employed to deliver this content have changed often and drastically. 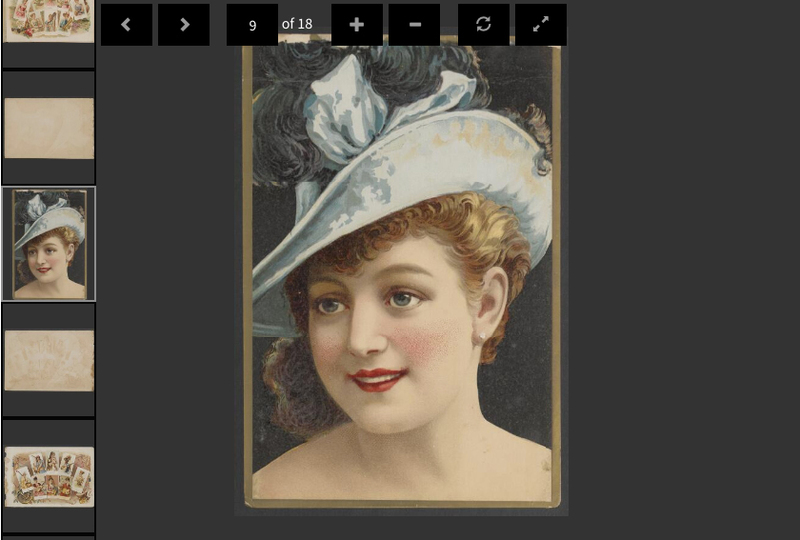 Two weeks ago, we announced the latest iteration of our digital collections interface with the release of the Tripod3. Currently Tripod3 only features one collection – W. Duke, Sons & Co. Advertising Materials, 1880-1910 – but in early 2016 all of the digital collections currently being delivered using Tripod2 (the predecessor to Tripod3) will be migrated to the new system. And that’s where I come in… Hello! I’m Maggie – DUL’s newly hired Metadata Architect, and I’ve been here for about a month and a half. Now that I’ve got my sea legs, I’m embarking on a project to remediate all of the Tripod2 metadata in advance of its migration to Tripod3. 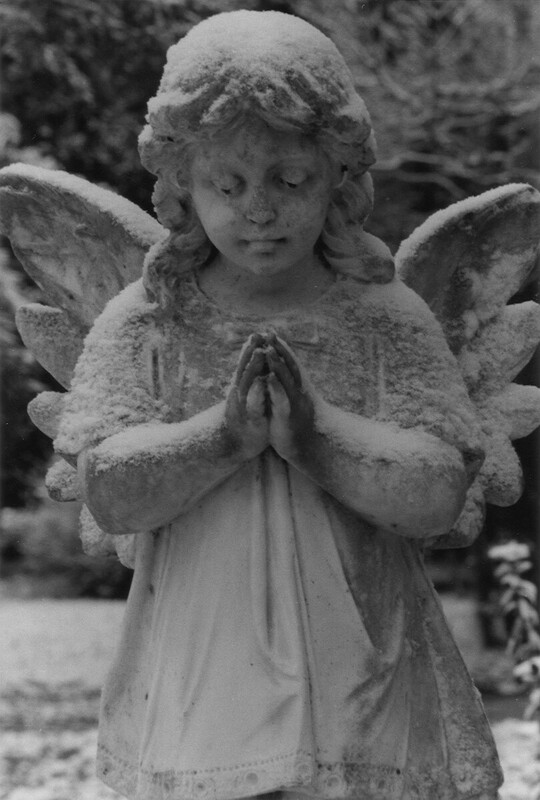 I’m not going it alone, though – we’ve formed a task group to guide this process as well as make recommendations for the ongoing creation and management of metadata associated with all materials in the Duke Digital Repository (and beyond). Partying like it was 1999. 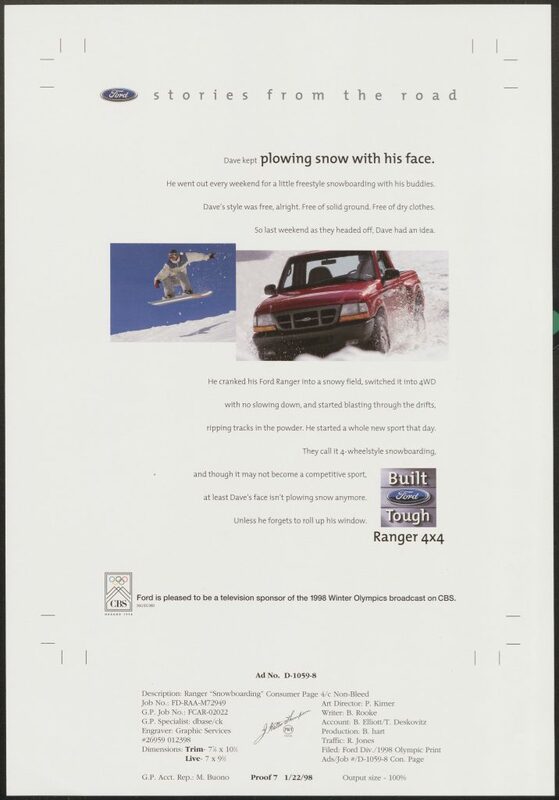 Back in 1995, when the first digital collections were being created, the focus was on providing access to those collections in a standalone way, and little thought was given to cross-collection and federated searching and browsing, because the capabilities just hadn’t evolved yet. We were still pretty excited about hypertext. Metadata standards and practices for digital collections were in their nascent stages, as well, and so their application was spotty and inconsistent. 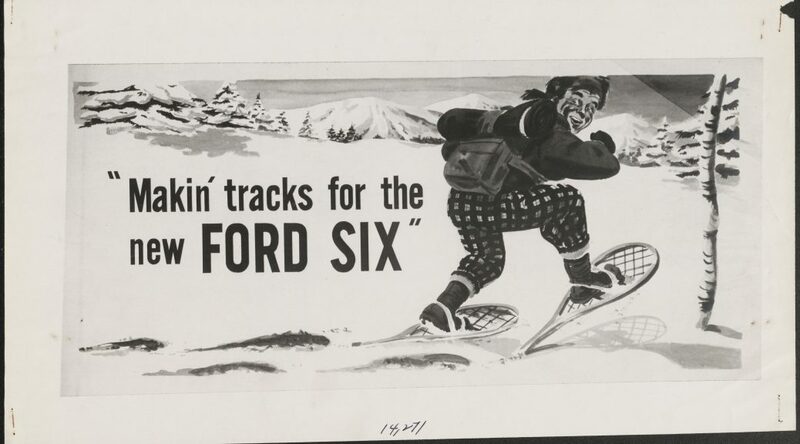 This resulted in the ‘silo-ization’ of our digital collections. Now, we have a robust, consolidated preservation and access system and the capability to share our collections much more broadly through aggregators such as the Digital Public Library of America. And LINKED DATA, y’all! But the discovery and access of our resources, even in the most sophisticated of systems, is only as good as the metadata used to describe them. 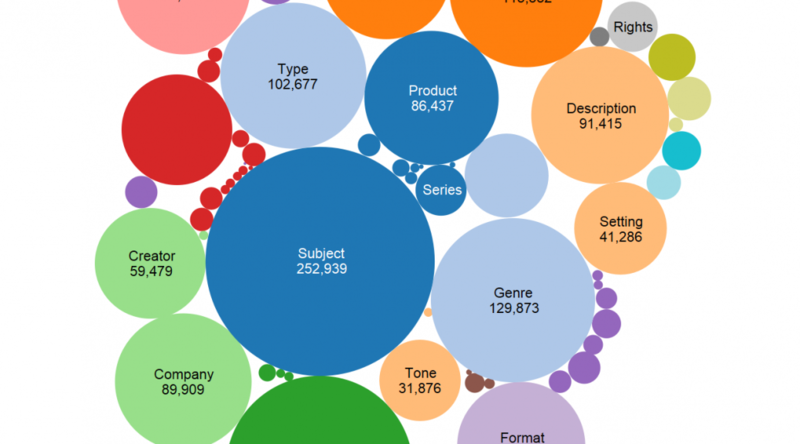 Remediating all of the legacy metadata is a big job – turns out you can create a LOT of metadata over the course of 20 years. Expressed as RDF, we have more than two million statements. And inevitably, as it’s been created over many years, by many people of varying backgrounds and experience, and according to many different practices and standards, it’s a mess. So, in the coming weeks and months, we’ll be tackling each and every one of the 85 (!) fields used in the creation of DUL’s digital collections, assessing usage and mappings and doing a whole heck of a lot of data munging (thank goodness for OpenRefine). And we’ll be diving into the world of linked data and reconciling our metadata against linked open data sets wherever possible. Once we’re finished with this project, our metadata will not only be beautiful, it will lend itself to a much more comprehensible experience for our users, as well as the ability to effectively and efficiently share our materials broadly. We’ve only just begun this work and will report on our progress periodically. Please stay tuned! It was September 6, 2011 (thanks Exif metadata!) 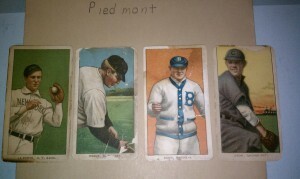 and I thought I had found one–a T206 Honus Wagner card, the “Holy Grail” of baseball cards. I was in the bowels of the Rubenstein Library stacks skimming through several boxes of a large collection of trading cards that form part of the W. Duke, Sons & Co. adverting materials collection when I noticed a small envelope labeled “Piedmont.” For some reason, I remembered that the Honus Wagner card was issued as part of a larger set of cards advertising the Piedmont brand of cigarettes in 1909. Yeah, I got pretty excited. I carefully opened the envelope, removed a small stack of cards, and laid them out side by side, but, sadly, there was no Honus Wagner to be found. A bit deflated, I took a quick snapshot of some of the cards with my phone, put them back in the envelope, and went about my day. A few days later, I noticed the photo again in my camera roll and, after a bit of research, confirmed that these cards were indeed part of the same T206 set as the famed Honus Wagner card but not nearly as rare. 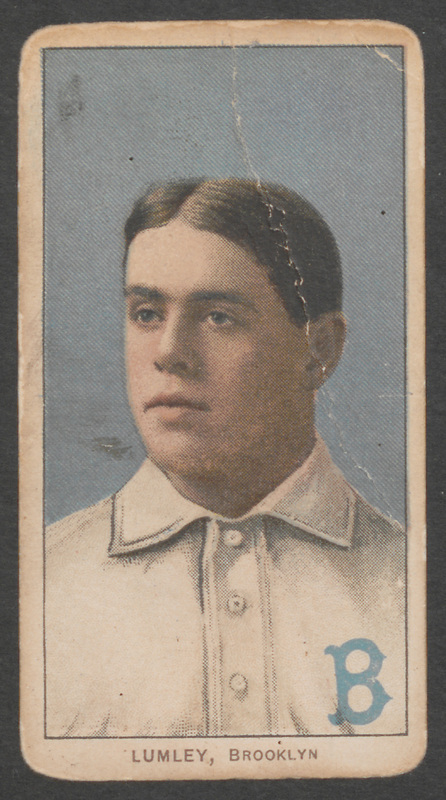 Fast forward three years and we’re now in the midst of a project to digitize, describe, and publish almost the entirety of the W. Duke, Sons & Co. collection including the handful of T206 series cards I found. The scanning is complete (thanks DPC!) 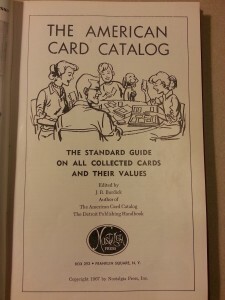 and we’re now in the process of developing guidelines for describing the digitized cards. 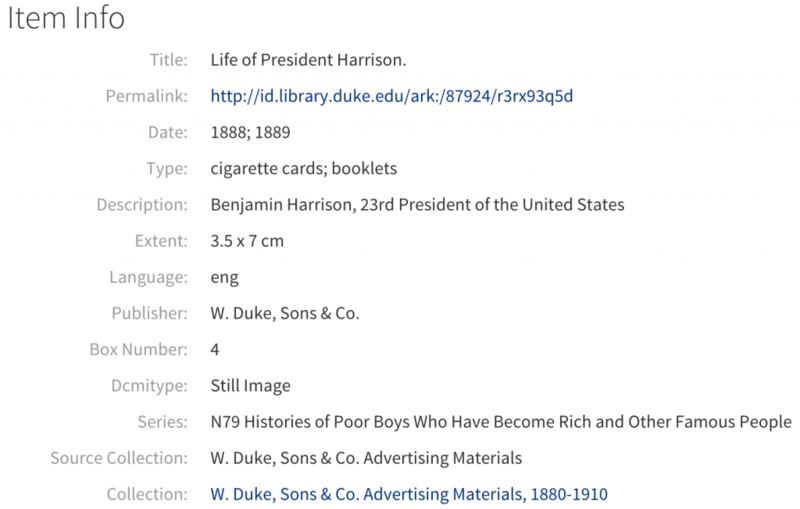 Over the last few days, I’ve learned quite a bit about the history of cigarette cards, the Duke family’s role in producing them, and the various resources available for identifying them. 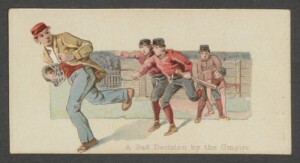 “A Bad Decision by the Umpire,” from series N86 Scenes of Perilous Occupations, W. Duke, Sons & Co. collection, Rubenstein Library. Beginning in the 1870s, cigarette manufacturers like Allen and Ginter and Goodwin & Co. began the practice of inserting a trade card into cigarette packages as a stiffener. These cards were usually issued in sets of between 25 and 100 to encourage repeat purchases and to promote brand loyalty. 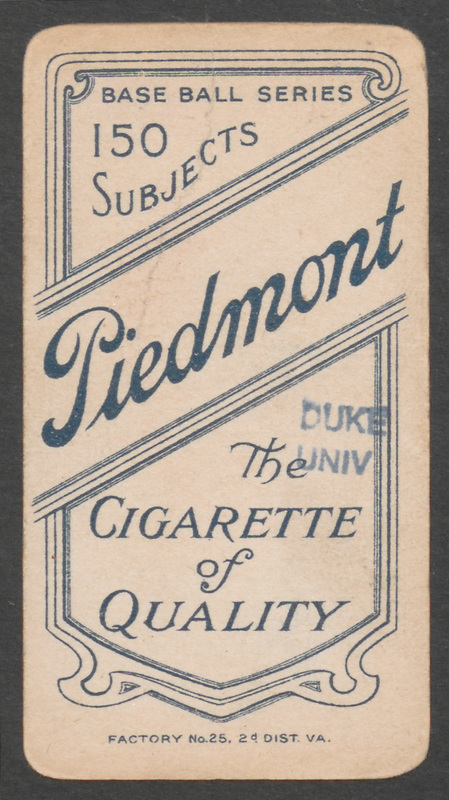 In the late 1880s, the W. Duke, Sons, & Co. (founded by Washington Duke in 1881), began inserting cards into Duke brand cigarette packages. 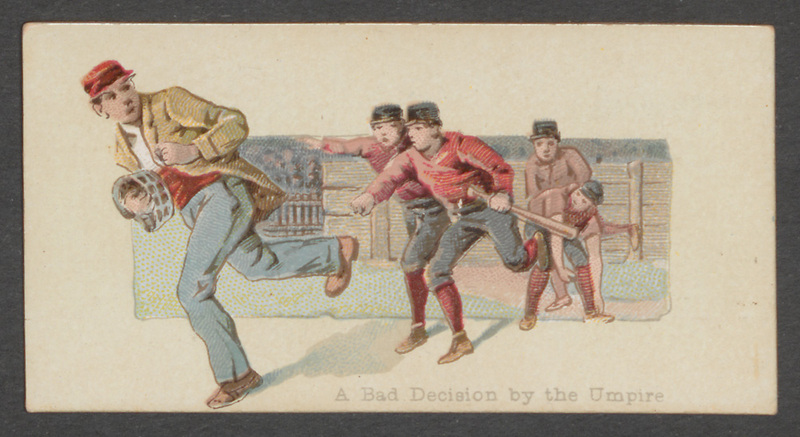 The earliest Duke-issued cards covered a wide array of subject matter with series titled Actors and Actresses, Fishers and Fish, Jokes, Ocean and River Steamers, and even Scenes of Perilous Occupations. 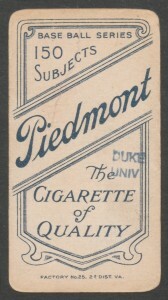 In 1890, the W. Duke & Sons Co., headed by James B. Duke (founder of Duke University), merged with several other cigarette manufacturers to form the American Tobacco Company. In 1909, the American Tobacco Company (ATC) first began inserting baseball cards into their cigarettes packages with the introduction of the now famous T206 “White Border” set, which included a Honus Wagner card that, in 2007, sold for a record $2.8 million. Title page from library’s copy of The American Card Catalog by Jefferson R. Burdick. 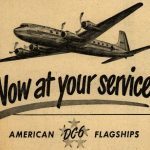 The T206 designation assigned to the ATC’s “white border” set was not assigned by the company itself, but by Jefferson R. Burdick in his 1953 publication The American Card Catalog (ACC), the first comprehensive catalog of trade cards ever published. 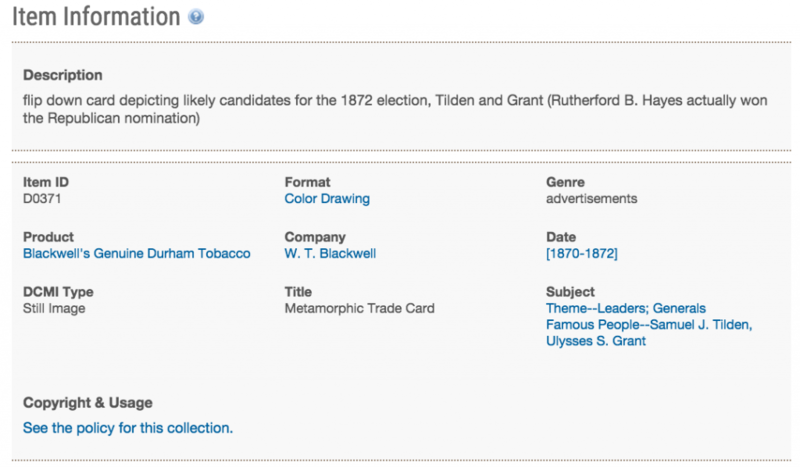 In the ACC, Burdick devised a numbering scheme for tobacco cards based on manufacturer and time period, with the two primary designations being the N-series (19th century tobacco cards) and the T-series (20th century tobacco cards). Burdick’s numbering scheme is still used by collectors today. Burdick was also a prolific card collector and his personal collection of roughly 300,000 trade cards now resides at the Metropolitan Museum of Art in New York. 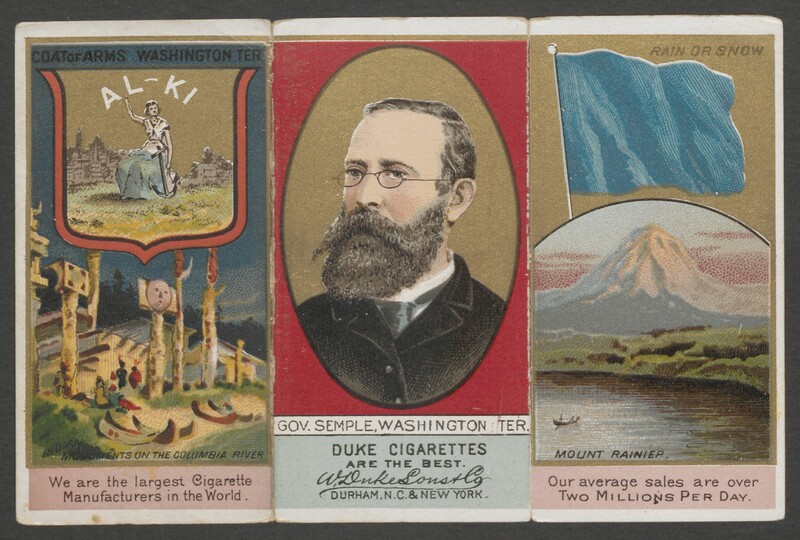 When published, the W. Duke, Sons & Co. digital collection will feature approximately 2000 individual cigarette cards from the late 19th and early 20th centuries as well as two large scrapbooks that contain several hundred additional cards. 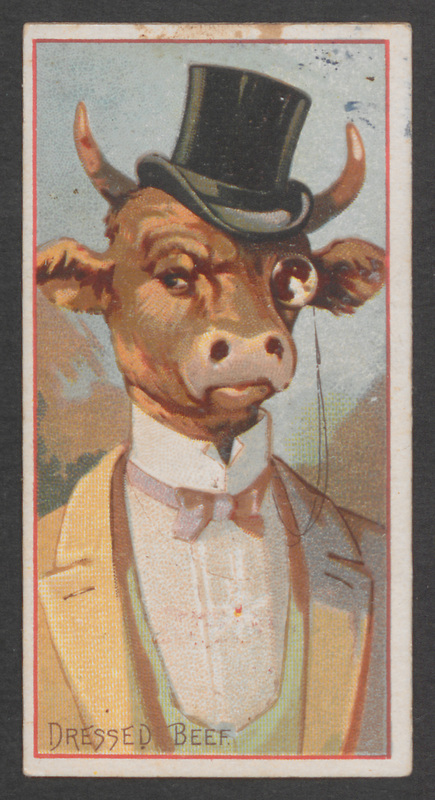 The collection will also include images of other tobacco advertising ephemera such as pins, buttons, tobacco tags, and even examples of early cigarette packs. 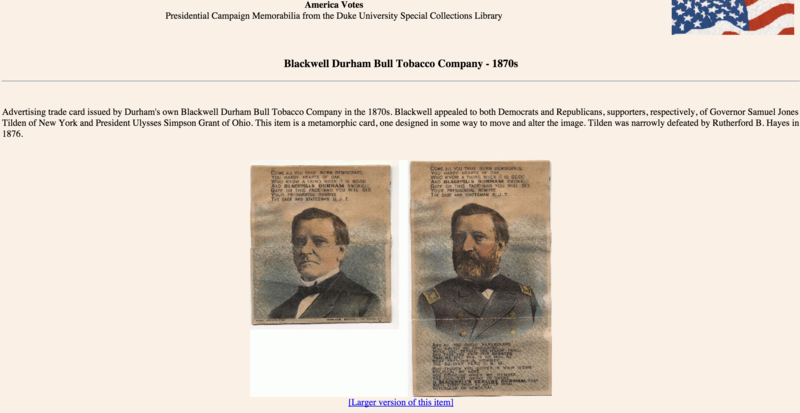 Researchers will be able to search and browse the digitized cards and ephemera by manufacturer, cigarette brand, and the subjects they depict. In the meantime, researchers are welcome to visit the Rubenstein Library in person to view the originals in our reading room.